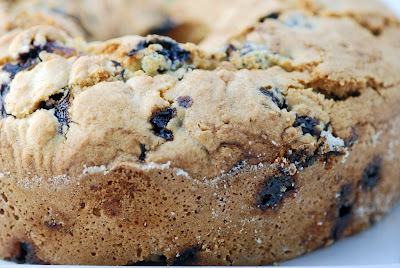 This is a classic southern pound cake made with Texas blueberries. We like our pound cake extra moist, so we pull it out of the oven when there's still a "sad" streak of batter in the middle. Some may call that underbaked, so feel free to bake the cake a few minutes longer if you lean towards "happy" pound cakes. Preheat oven to 325°. Grease pan and dust well with 1/4 cup sugar. Combine 2 3/4 cup flour with baking powder and salt. Dredge blueberries with the 1/4 cup flour and mix well to coat. We use fresh blueberries, but frozen work well too. Cream butter and sugar. Add eggs one at a time. Mix well each time. Add vanilla and mix well. Slowly add dry. When fully incorporated, fold in blueberries. 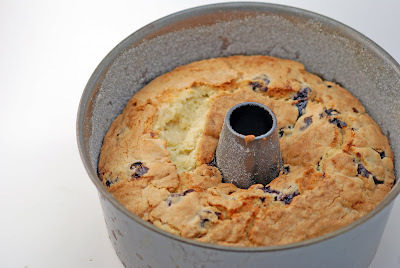 Batter will be very thick so some of the blueberries may get mashed up in the process. Bake until golden brown on top and cooked through, 75 minutes in our oven. It's ok to have a bit of a moist, "sad" streak in middle of the cake when you remove from oven. Cool, then dust with powdered sugar. Serve at room temperature or toasted with some lemon curd or blueberry preserves on the side. In the summer, we have wonderful bushes full of wild and domestic blueberries. This will be the first thing they make! 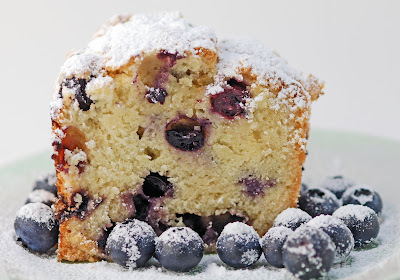 Scrumptious cake, I love blueberries! This pound cake looks AMAZING! YUM! YUM can you cut me a slice - beautiful!! can i use 2 cups of frozen blueberries? This pound cake is amazing. I also tried it with blackberries and it was equally as good. I have made this recipe for numerous lunchs at my workplace. Everytime I'm asked for the recipe. Absolutely amazing cake. Dang, that looks so good. 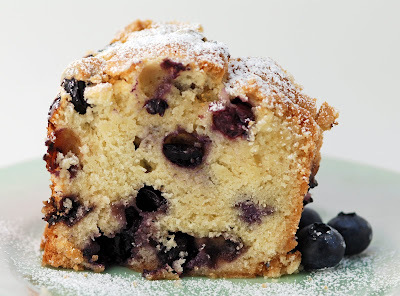 I love blueberry muffins and blueberry pound cake. I actually have some friends who grow their own blueberries and make stuff like this all the time, its the best. 2 cups of sugar does seem like a lot. I like to take away some of the sweetness in mine, then I can eat more without feeling sick or bad about it.